MATBUS offers a variety of advertising opportunities for companies wishing to market themselves in a uniquely effective way. Unlike stationary advertising options, our vehicles travel throughout the city limits of Fargo, Moorhead, West Fargo and Dilworth every day. This allows the advertisements to be seen by a large segment of the city at any time, e.g., people in cars, on sidewalks, and looking out windows from businesses and homes. MATBUS has a range of options for any campaign objective and any budget. Advertisers can also select whether they want to use Fargo/West Fargo buses, Moorhead/Dilworth buses, or the full metro system. For full pricing and size details, please reference the MATBUS Advertising Kit at the bottom of this page. Exterior advertising involves vinyl adhesive artwork applied to the outside of our large fixed route or smaller paratransit vehicles. There are a variety of sizes available, from smaller rear or side panels up to large full bus wraps. 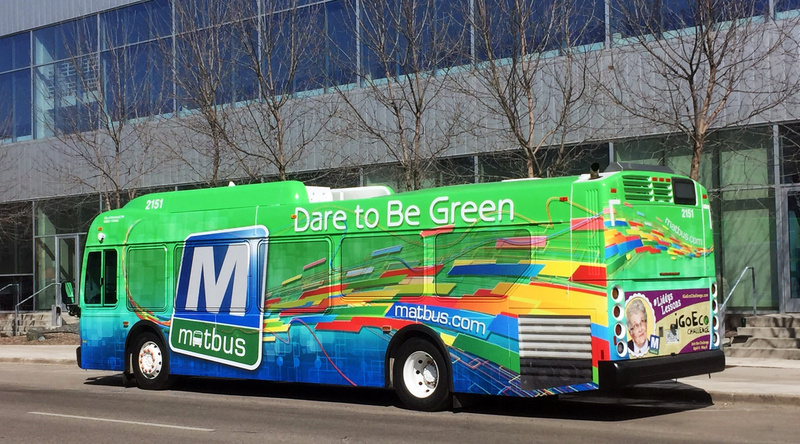 Advertisers have used MATBUS exterior wraps to highlight short-term events and promotions, multi-year branding campaigns, and everything in between. 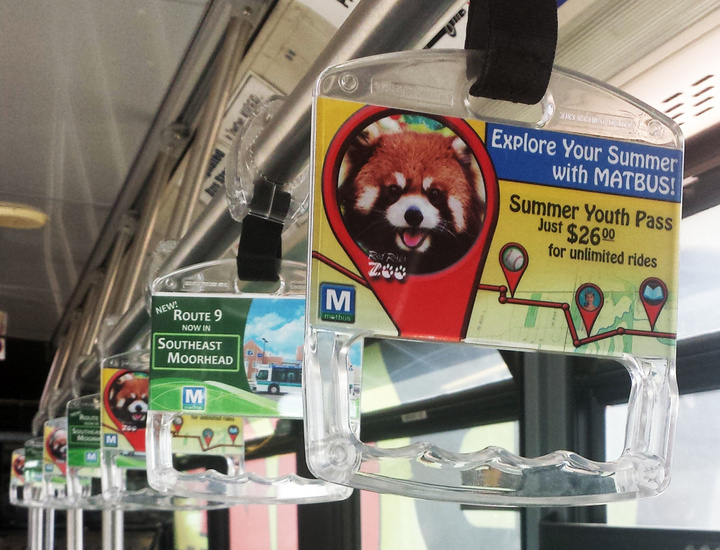 Interior ads make it possible for advertisers to directly reach bus ridership with a more targeted message. These ad options are available on fixed route vehicles. Advertising Handle - These full-color ads are double sided and placed in the display window of passenger handles. Each bus has 12-20 handles attached to bars on each side of the bus interior. Ceiling Advertisement - This full-color ad is produced in the same material as exterior advertising wraps and placed on the ceiling of fixed route buses.